With the ends of a floor-length white skirt in her hands, Iris Rosa moves her arms gracefully from side to side and shuffles her feet on the dance floor. "This is the dance of Yemaya," she explained to the group of African American Dance Company students gathered around her. "She's the goddess of the ocean, so you see how I'm moving my skirt to look like waves?" Rosa, founding director of IU Bloomington's African American Dance Company and professor emeritus in the Department of African American and African Diaspora Studies (she retired from her IU positions in May), has been mastering this move since her first trip to Cuba in the 1990s. For as long as she's been researching Cuban dance, she has wanted to take her students to the island. So when she received a letter from the Cuban Ministry of Culture inviting the dance company to an international festival, Rosa jumped at the opportunity. The African American Dance Company will visit Santiago, Cuba, July 2 to 10 to participate in Festival del Caribe, an annual international dance and music festival. The dance company is one of three performing ensembles in the African American Arts Institute, an Office of the Vice President for Diversity, Equity and Multicultural Affairs program, and is a course offered through the Department of African American and African Diaspora Studies. 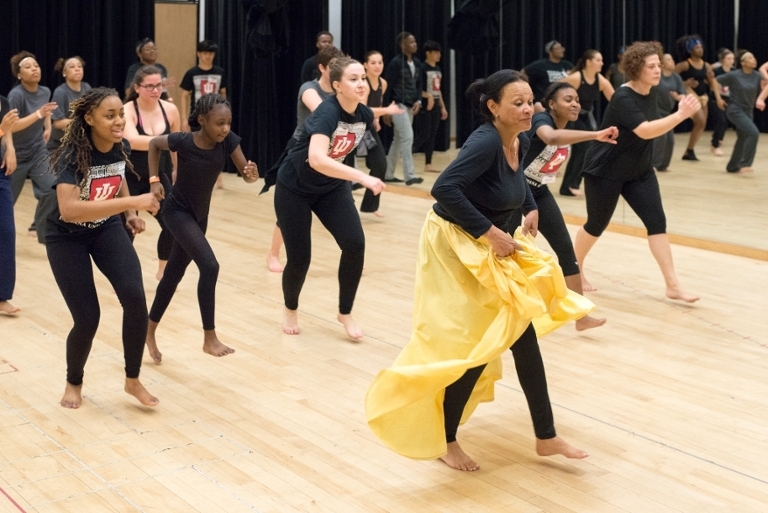 "For more than four decades, the African American Dance Company has been one of IU Bloomington's most renowned and engaged cultural institutions," said IU Bloomington Provost and Executive Vice President Lauren Robel. "The faculty and students in the company are wonderful ambassadors for IU, whether they're performing in the local community or in venues around the world. The Cuba trip is an exciting new chapter in their history of outreach, collaboration and world-class performances." The group of 14 IU students will take classes with Cuban dance professionals and attend performances and lectures focused on the social, historical and cultural aspects of the performing arts. They'll also perform Rosa's choreography on the festival stage, sharing it with dance companies representing countries like Mexico, Haiti and Curacao. Milagros Ramirez, Cuban dance artist and instructor at the African American Dance Company Annual Dance Workshop, was so impressed by Rosa and the dance company's work that she felt it needed to be shown to the international dance community. She helped to secure their spot in the festival and organize the trip. "This festival is an important international event confronting and exchanging different cultures, fundamentally of Caribbean America and Africa," Ramirez said. "It is a great opportunity for the students to enrich their knowledge and to see and to feel the cultural riches of Cuba closely." The weeklong program will be an immersive experience in Cuban dance and culture, giving students a broader understanding of the African diaspora. They'll learn popular dances like son and mambo as well as African-derived songs and dances of Yoruba and Arara people characteristic of Eastern Cuba. Because dance is an integral part of Cuban life, the students will learn about history, culture, politics and religion as much as the dance movements themselves, Rosa said. "This experience will help the students to be able to look at life in a wider spectrum outside of our own understanding," she said. For several in the group, like IU junior Sade Roberson, this is their first time traveling outside the country. Roberson looks forward to the dance classes and performances, but also to applying her experiences to her major in hospitality management. "I see this experience helping me in my future. It will help me build a mindful state for being in the hospitality field so that I will be able to understand people from different cultures and backgrounds," Roberson said. After teaching courses in black diasporic dance for 43 years at IU, Rosa is known for exposing students to different cultures. But taking students abroad in recent years has given her the chance to instill a deeper sense of global awareness. Last winter, the dance company traveled to Beijing, China, for a cultural exchange with China University of Mining and Technology Beijing. For the students traveling to Cuba who also participated in the Beijing exchange, Rosa is encouraging them to compare their international experiences and then share their knowledge with peers in the classroom and professional settings. The Cuba trip is a rare opportunity not only for students but for the IU community. Among the group will be Valerie Grim, professor of African American and African Diaspora studies, and Nyama McCarthy-Brown, professor of contemporary dance and three African American Dance Company alumni. Alumna Alex Long was a member of the company for all four of her years at IU. "This trip will be significantly important to me as an alumna because my connection with the company has remained strong since I graduated from IU in 2015," Long said. "To now have the opportunity to travel to Cuba with this distinguished professor and mother figure who is leaving her position of 43 years is absolutely incredible and surreal." The company's international experience is supported by IU Bloomington's Office of the Vice President for Diversity, Equity and Multicultural Affairs, Office of the Provost, College of Arts and Sciences, and Office of the Vice President for International Affairs. For Rosa, it's an honor to represent IU abroad and give another experience to her students before leaving the university. "Hopefully they will carry it with them throughout the years," she said. Visit the African American Dance Company's blog to follow its experiences in Cuba. Hannah Crane is the events and communications specialist for the African American Arts Institute.